The classic baseball tee with raglan 3/4 sleeves takes on a fresh update with super soft blends. 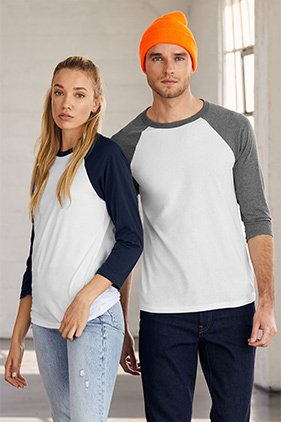 52% Airlume combed and ring-spun cotton 48% polyester, 40 single 3.6 ounce unisex raglan baseball tee. Contrast 3/4 raglan sleeves and neck trim. Side-seamed. Retail fit. Unisex sizing.